Since the 2008 global financial crisis, major changes have taken place in Asia central banks’ reaction functions. Many have demonstrated a strong commitment to inflation targeting and domestic price stability, while some others are choosing between counter-cyclical and pro-cyclical policies. 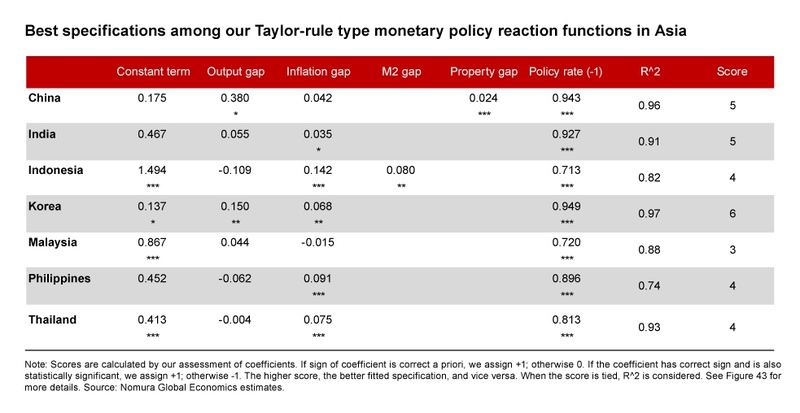 The Taylor rule, named for macroeconomist John Taylor, is a well-known, simple, central bank reaction function that links the level of the nominal policy rate to deviations of inflation target, and of output from its potential. We look through the lens of augmented Taylor-type rules for Asian monetary policy and explored various themes, including a closer examination of the changes, the rationale behind them, the best representative reaction functions today, and forecasts for Asian monetary policy into 2020. A monetary policy reaction function specifies the policy rate as a function of predetermined endogenous or exogenous variables observable to the central bank at the time that it sets its policy rate. In the Taylor-rule type specification that we used, independent variables taken into consideration are output gap, inflation gap. We also extend our basic specification by adding different measures of exchange rate gaps, the M2 gap, the domestic credit gap or the property price gap but with mostly insignificant results. We find no strong evidence of Asian central banks reacting to exchange rates and only limited signs of monetary policy responding to money gaps (Indonesia) and property price gaps (China). We see strong commitment to inflation targeting and domestic price stability in Asia after the 2008 crisis, especially in China and Malaysia. This is reflected by the small inflation gap coefficients due to Asian central banks’ explicit shift to credible inflation targeting from money supply or exchange rate targeting. Another change since the 2008 crisis is the different monetary policies chosen. A notable example of counter-cyclical policy is Korea, proven by the positive output gap. This is mainly because more anchored inflation expectations can reduce inflation persistence and limit the pass through of currency depreciation to domestic prices, allowing monetary policy to focus more on reducing output fluctuations. In contrast, output gap coefficients in Indonesia and the Philippines are estimated to be negative, meaning that those central banks hiked rates to manage inflation risks at the cost of weaker growth, also known as a more pro-cyclical approach. This is mainly because capital flows complicate the conduct of monetary policy in Indonesia and the Philippines, with monetary policy being loosened in periods of strong capital inflows and currency appreciation (resulting in strong growth and low inflation), and being tightened in the event of outflows and currency depreciation (weak growth and high inflation). Another notable change is the stronger inertia of policy rate adjustments. Smoothing coefficients have increased since the 2008 crisis for all Asian economies. There are a couple of explanations for such a very gradual or cautious adjustment of policy rates in Asia. First, there is uncertainty about the macroeconomic model, or about the values of its parameters, as the 2008 crisis triggered major structural change in the global economy. Second, major developed central banks (e.g., Fed, ECB and BOJ) have adjusted their policy rates very gradually. Third, higher domestic debt-to-GDP ratios in Asia, along with low and stable inflation, made Asian central banks more cautious in raising policy rates, although the Fed continues to hike rates gradually. Indeed, adjusting interest rates in small steps spread out over time can prevent financial institutions from having to make significant alterations to their balance sheets. Finally, financial markets may react adversely to frequent changes or reversal of policy rates. 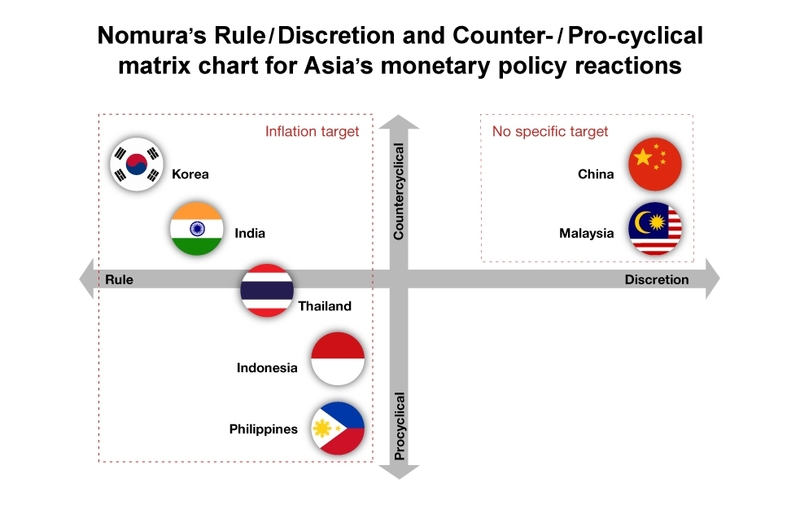 Together with our best specifications for monetary policy reaction functions in each Asian economy and our matrix chart that compares countries in terms of their policy scales, we are able to get an idea on how central banks react. We believe further yet final rate hikes will take place for domestic price stability or monetary policy normalization. Asia’s economic cycle is expected to move toward the contraction phase into 2019, amid ongoing monetary policy normalization in developed economies and the US-China trade conflict. Under these circumstances, Asia’s GDP growth will likely slow, but CPI inflation should rise due to lagged effects of strong domestic demand, higher oil prices and currency depreciation. We see two main drivers of further, yet final, rate hikes into 2019 – inflation and monetary policy normalization. The notable exception is China, where we expect outright monetary easing. If growth weakens and inflation rises much faster, we would expect some Asian central banks, such as Korea’s, not to respond to cost-push inflation but to leave nominal policy rates unchanged through 2019 (i.e., much lower real policy rates than our base case). However, we would expect other central banks, such as Indonesia, the Philippines, and India, where inflation expectations are not well anchored, to hike rates faster to manage inflation risks at the expense of much weaker growth. In this stagflation scenario, we would expect more expansionary fiscal policy as Asia’s central banks face too high a hurdle in cutting nominal policy rates due to financial-stability risks unless the Fed chooses not to hike rates anymore. For more insights into Asia monetary policies and detailed country outlooks, click here. Output gap: (real GDP - potential GDP)/potential GDP. Inflation gap: Headline CPI inflation less inflation targets. REER gap: Year-over-year growth rate of the real effective exchange rate. NEER gap: Year-over-year growth rate of the nominal effective exchange rate. USD/Asia currency gap: Year-over-year growth rate of USD/Asia currency from three-year average. M2 gap: Year-over-year growth rate of broad money supply (M2) deviation from three-year average. Credit gap: (credit % of GDP – long-run trend credit % of GDP)/ long-run trend credit % of GDP. Property gap: Year-over-year growth rate of real property price (2010=100) deviation from three-year average.